Welcome to Veranda Restaurant & Cafe! 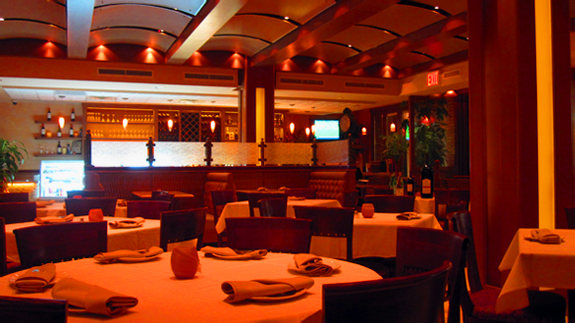 Located in the heart of Bayside, Veranda is a bistro style restaurant offering American contemporary dishes served with a Mediterranean flair in an upscale casual dining atmosphere. The menu features seasonal fare all modestly priced and always with fresh ingredients and great taste supported by a hand-picked wine list and iconic cocktails! Emulating a quintessential neighborhood bistro, Veranda turns simple classics including T-Bone steak, herb-crusted salmon, kobe beef burgers, and mac-n-cheese to its own "veranda style" signature dishes! Beyond the classics, Veranda's menu pleasantly surprises with dishes including the warm goat cheese fondue with apricot, zucchini chips with homemade tsatsiki, and yellowfin tuna sandwich, which are increasingly becoming crowd favorites! Veranda brings the outdoors in and the indoors out by opening its folded glass paneled doors to the outside veranda seating over 100 people. Enjoy the outstanding food, refreshing drinks or a specialty coffee on the veranda, whether in the sun or under a terracotta umbrella, in the midst of a waterfall and garden landscaping. 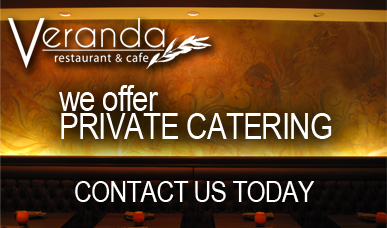 With an intimate indoor and outdoor setting and fine dining, Veranda is the perfect place to host private dinner parties and special events! We have been to Veranda twice. Both times the food and the service were outstanding. As good as any restaurant in Manhattan. I recommend to anyone who loves good food, wonderful ambiance, and fabulous service. Leave a comment for us. © 2010 Veranda Restuarant & Cafe. All rights reserved.